Welcome Kit (or Welcome back!) When people join Feminists for Life they often say, “I’m home!” Feminists for Life welcomes new members and gift members (including student members) and welcomes back home those whose support has lapsed—each with a very special kit. Kit includes two magazines (“First Wave Feminists” and “Pro-Woman Answers to Pro-Choice Questions”), all three basic brochures, and an FFL bumper sticker. It is the only way you can get our official “Feminists for Life” bumper sticker. $35 membership contribution or donation, or better yet, start a monthly gift of $5 or more a month. 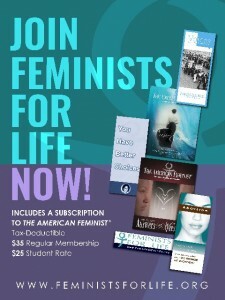 Includes membership and subscription to The American Feminist.